Japanese researchers monitoring the activity of giant jellyfish in Chinese waters are warning of a potentially historic and catastrophic invasion this year. Marine surveys conducted in late June have revealed alarming numbers of Nomura's jellyfish -- massive creatures that grow up to 2 meters (6 ft 7 in) in diameter and weigh as much as to 220 kilograms (about 450 lbs) -- lurking in the Yellow Sea and East China Sea. 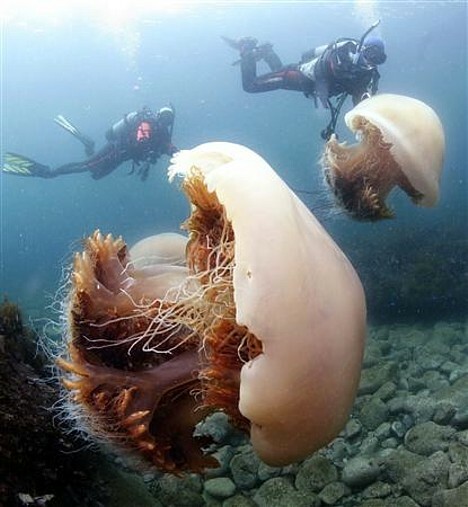 The researchers warn that ocean currents may bring swarms of the monster jellies to Japan, which has been plagued by similar invasions in recent years. Based on what they have seen so far, the researchers warn this year's onslaught of Nomura's jellyfish (Nemopilema nomurai, or Echizen kurage in Japanese) could deliver a massive blow to Japan's fishing industry, rivaling even the devastating 2005 deluge that caused tens of billions of yen (hundreds of millions of dollars) in damage nationwide. The surveys are being conducted by a team led by Shinichi Ue, a professor of biological oceanography at Hiroshima University who also chairs a government research committee tasked with developing technology to predict and control jellyfish explosions. Ue has been monitoring the population density of Nomura's jellyfish in the southern Yellow Sea and northern East China Sea since 2006. Between June 20 and 24, 2009, Ue's team observed numerous specimens with umbrellas measuring 10 to 50 centimeters across, and they calculated an average distribution of 2.14 jellyfish per 100 square meters. This figure is more than 200 times higher than the 0.01 jellyfish per 100 square meters observed in the same region in 2008. It is also nearly triple the 0.77 jellyfish per 100 square meters observed in 2007, when the fishing industry in the Sea of Japan suffered widespread damage. To make matters worse, this year's swarms appear to be taking a more direct and southerly route to Japan, unlike in 2007 when the jellyfish appeared to take a more northerly route, approaching the Sea of Japan coast from the direction of Korea. According to the researchers, the ocean currents could bring unprecedented numbers of Nomura's jellyfish to Japan's Pacific coast, which typically sees far fewer of the monster blobs than the Sea of Japan coast. Nomura's jellyfish typically bloom in Chinese waters in spring, and they mature into adults as ocean currents slowly carry them north. By July, when the first swarms reach Tsushima (just north of the southern island of Kyushu), many jellyfish are as large as sumo wrestlers. At this size, it only takes about 5 or 10 of them to destroy a commercial fishing net. In addition to damaging nets, the giant jellyfish are blamed for killing other fish with their venom, lowering the quality and quantity of catches, increasing the risk of capsizing trawlers, and stinging fishermen. In 2005, the fishing industry reported over 100,000 cases of jellyfish-related damage nationwide. At the peak of the invasion that year, an estimated 300 to 500 million monster jellyfish passed through the Tsushima Strait into the Sea of Japan each day. I've heard about this invasion many times as it has been reported quite extensively, here in the UK. It looks like there is nothing that can be done to arrest the jellyfish, so God only knows what will happen when they 'attack'..
Why don't they just eat them & leave the Dolphins & Whales alone? Um, they *do* eat them. Kurage is served cold, in a delicious soy-vinegar (maybe other things as well) sauce. Crunchy. I have a feeling that Japan eats much more Kurage than whale (by weight anyway), as you see it on far more menus. 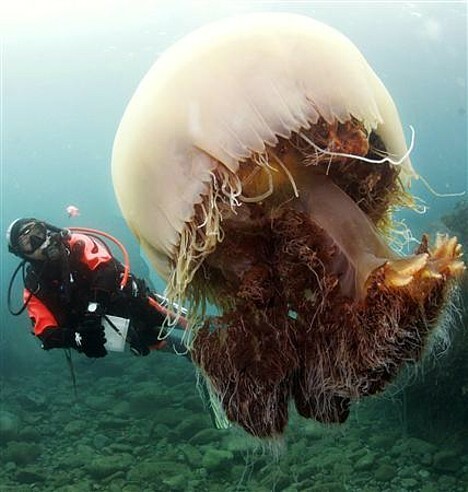 That is one big jellyfish! Dude, you're (correctly used) weird. Learn the difference between your and you're, IDIOT! He isn't using it wrong. You're, is short for you are. So, used in the sentence, ”Dude, you are weird.” He is saying it correctly. IDIOT! The Japanese have recipes for everything. That is a cauldron full of soup, though. Is this for real or is it a Japanese science fiction movie aka Godzilla? Nature's answer to over-fishing, over-whaling, and over-polluting. Japan once put out a movie called "Godzilla vs. the Smog Monster" where the pollution becomes sentient and turns into an evil, sludge-slinging creature. Well, these jellyfish are the world's smog monster, come home to roost. glub. I read in national geographic that some group has been trying to destroy these suckers (er stingers) for years, catching hundreds, cutting them up and tossing the chunks back in the ocean. Trubs wuz, these gummy sumo fish basically spill all their pre-fertilized eggs when they are stressed, so the quantity has quadoopippled... they also think pollution makes these predators more dead. JAPANESE KILLED MILLIONS OF DOLPHINS, WHICH ANIMALS ARE VERY INTELLIGENT AND EVEN IN THIRD WORLD, EVEN IF FISHERMEN STARVE WOULD NEVER HURT A DOLPHIN. SO I DO NOT SYMPATHIZE WITHE THE JELLY FISH INVASION. IT IS SAID THAT WHEN THE FISHERMEN'S BOATS WERE CAPSIZED, DOLPHINS SAVE THEM FIGHTING AGAINST THE SHARKS. sure is BAWW in here. Actually 'fish expert' there have been well documented cases of dolphins saving humans. Hopefully, they'd leave you to drown in your ignorance. Amazing pictures! From what I've read, it's really hard to get rid of these beasts because they switch into reproductive mode if they're attacked, squirting out lots of baby jellies. LOL Could you imagine if humans did that? Kusakus, it is actually "you're" as in the abbrieviated "you are wierd" and not "your weird" which would suggest possesion of a "weird" by Mike. I did actually pee in your Mum (Australian spelling). I say feed the Jap fishermen to the jellyfish. OY! This is their fault for eating the sharks other fish that take control the number of jellyfish. there is nothing wrong about fishing, but catching thousands of sharks to cut their fins for soups and drop the rest of the body is a crime! I think the shark fin eaters are more CHINESE than Japanese. Btw, Sharks are massacred not really for soup but for the old culture of eating the fin cooked in broth. Try to get your facts right at least before pointing blame at someone. As for whale hunting, Japanese are not the only culprit. Countries such as Norway and Iceland are strong backers of Japan and also guilty of being avid whale hunters. The idea is not just blasting countries and think that will solve all problems, you cannot get a country to stop their culture overnight because of a growing problem. How about US, one of the MAJOR air polluting countries? Churning out massive carbon gases for several decades and now trying to play nice after the world is suffering from greenhouse effect? Should the rest of the world tell united states to cease all manufacturing as they have overexceed their Quota? No right? How do u expect countries to stop whaling immediately? It's all about balancing values, culture and views. Will the oceans current take these Jelly Fish to the East Coast of United States. Do they come to the surface of the ocean (like beach areas)? Pretty scary if you are out swimming, will they attach humans?? It's not like "overnight"! Most civilized nations quit whaling decades ago. Hopefully the greenhouse gases will delay the next, inevitable ice age! Jellyfish invasions have not only occured in Japan, but also in the Gulf of Mexico and around the world. The invasion of jellyfish is a worldwide problem and not merely a problem for the Japanese. The result of overfishing (around the world) has led to an overpopulation of jellyfish. We cannot just lay blame with one country! Hilarious. Even though I came across this "jellyfish" blog by accident I know that over fishing has to do with the awesome "jelly invasion" but it is not about lack of fish to eat the things. It's about retarded, no-brained fisherman who catch jellyfish and throw the carcasses back into the ocean. They slaughter them without knowing anything and don't realize that lots of the invading jellyfish produce thousands of offspring per jellyfish as a natural defense adaptation when killed. I SURRENDER OH GREAT JELLYFISH OVERLORDS!!!! Troubled countries should harvest the jelly's for organic composting to produce organic fertilizers, subsequently they would cut down on the amont of industrial fertilizers for crops and nitrate run-off pollutiobn. This coul;d also be done with the Asian jumping Carp invasion in US waterways. Yesterday evening I saw a program on television concerning the Nomura Jellyfish causing the Japanese Fishing Industry billions of Yen losses. I might be able to help you in eliminating this modern plague. I realize there are as many as 500 million of these unfreindly creatures invading the Sea of Japan. My approach might at first sight sound strange but given my track record in related fields I strongly suggest yuou take my offer seriously. Since 40 years I am engaged in the field of subtle energies. I have developed about 800 natural remedies made from precious and semi precious stones in the Ayurvedic tradition as well as trace elements made from native minerals and ores. I have been able to treat many of themost difficult ailments. In 1994 I was decorated by the European Union for humanitarian work and received in 1997 the Grand Cross of the Belgian Order of Merit for inventions. So that you may see what I did concerning plants I attach a testimonial from a Garden Center.This shows you that I do not have to be present in a particular place to be able to assess the problem and find a suitable solution. I am sensitive and feel energies. At some time in the past I have been able to remove insects that were investing a wall of a Villa of a customer in Switzerland. I have also developed in the past frequencies to eliminate varoas on bees. However as the work involved was much bigger then the economic result for me saving a few beehives I had to discontinue this activity. Besides making remedies from gems and minerals and a few wild plants I can create most any frequency required and introduce this into water and even work on pictures at a distance. If you would like me to perform some tests on a small scale with the aim to eliminate the Nomura Jellyfish (Echizen jellyfish) please let me have the following data. Scientific name of the various varieties of Jellyfish you want to eliminate. A photograph taken from a few living specimens in each category while they are in an aquarium. I would then proceed to research and find the vibratory frequency of those respective species. Produce the opposite frequency in view to eliminate them. Work with the found frequency on the picture, with in my opinion a very likely solution to eliminate them quickly. Seeing the area is huge and the number of Jellyfish huge it would not be possible as with the plants to spray the area involved but i strongly feel I could handle this project in a different way. After obtaining satisfactory results on a small scale I would then work on arial or satelite pictures covering a larger area of the Sea of Japan if your government wants me to do this. I am currently in Germany where I will be involved in a project producing algae (Chlorella) with a new technology and where my appraoch will increase the production of Biomass as we are interested in transforming the Biomass into Biogas and fuel. Sounds like some recipies would be in order. If man finds a comercial use for them the numbers will readily decline. Celebrity Paycut - Encouraging celebrities all over the world to save us from global warming by taking a paycut.